Salvage crews have removed the first of seven barges stuck near the Marseilles Dam on the Illinois River, but officials warned that an imminent drop in water levels is going to cause extended delays to commercial ship traffic. The barge, which is loaded with iron ore fines, was pulled from the dam Tuesday morning by tugs, and work continued Wednesday on the remaining six barges either floating or submerged near the dam. The barges have been stuck there since last Thursday when the M/V Dale A. Heller, a 128-foot towing vessel owned by Ingram Barge Company, lost control of its tow due to strong currents from heavy rainfall that has impacted the region. 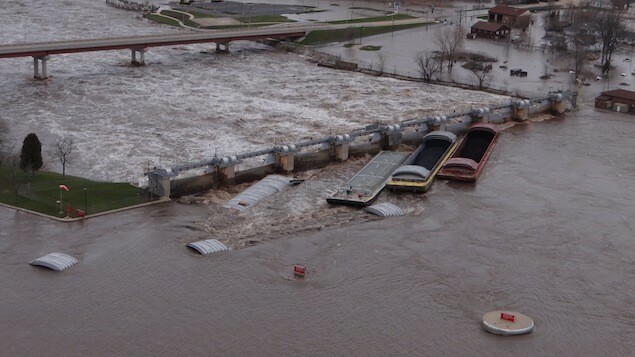 Seven of the Dale A. Heller’s 14 barges broke free and came to rest against the Marseilles Dam, causing damage to some of the dam’s gates. Four of the seven barges also sank near the dam. So far there have been no reports of pollution. “Ingram is working closely with the U.S. Coast Guard and the U.S. Army Corps of Engineers to ensure that all salvage operations are handled in a safe and secure manner,” Scott Noble, senior V.P of ingram Barge Company, said on Tuesday. Salvage continued Wednesday with the dewatering of one of the submerged barges. The Army Corps of Engineers was on scene with a large crane to offload the barge’s cargo if needed to help with the refloat. An inspection by the Army Corps of Engineers on Sunday determined that the dam was structurally sound but the anchorage systems on gates two and three had been broken.